I’m telling you, the player on the left could still win this match. Come on, take the castle already. This game has been going on for an eternity. Well, at least since 1983. The Chess Players is one of those fun artworks that make people stop if not take photos. Two life-sized men are playing chess, neither having a great advantage. However, the older gentleman on the right holds the queen in his hand and showing a slight smile while the other looks sad. A key piece has been won and the game’s outcome will soon follow. But you know, if the other guy moved his castle . . .
American artist Lloyd Lillie actually modeled the two figures after family members. This right one is his father, the left his son despite the ages seeming the same barring close inspection. The bronze artwork lies in John Marshall Park on 4th and C Sts. N.W. aside the Canadian embassy and just a short stroll from the court houses. Supposedly, the park is the perfect place for lawyers to play chess on their lunch hour, though I’ve never stumbled upon a live version. 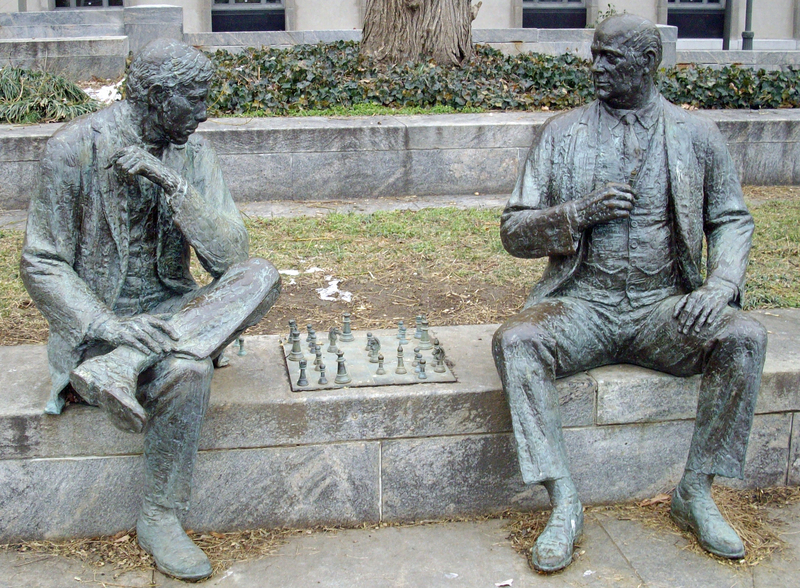 This entry was posted in Monuments and Statues and tagged best DC walking tours, free Washington D.C. attractions, John Marshall Park, Judiciary Square, Photo by Rick Snider, statue, The Chess Players. Bookmark the permalink.